Home / Visit Sunbird in London, Oslo, and Paris! Visit Sunbird in London, Oslo, and Paris! Next week, Sunbird will be busy attending three tradeshows in the span of two days! If you're in London, Oslo, or Paris, be sure to stop by to meet us. We'll be at Data Centre World from March 21-22 at ExCeL London. Stop by Stand D245 to meet us and explore how to radically simplify your data center management. Register for free to join the world's largest independent data center event with over 20,000 of your peers, hundreds of leading data center and technology providers and hundreds of the world's brightest minds & industry practitioners. If you'd like to set up an individual meeting, let us know. On March 21, we'll be at Datacenter Forum in Oslo at the Radisson Blu Scandinavia Hotel. 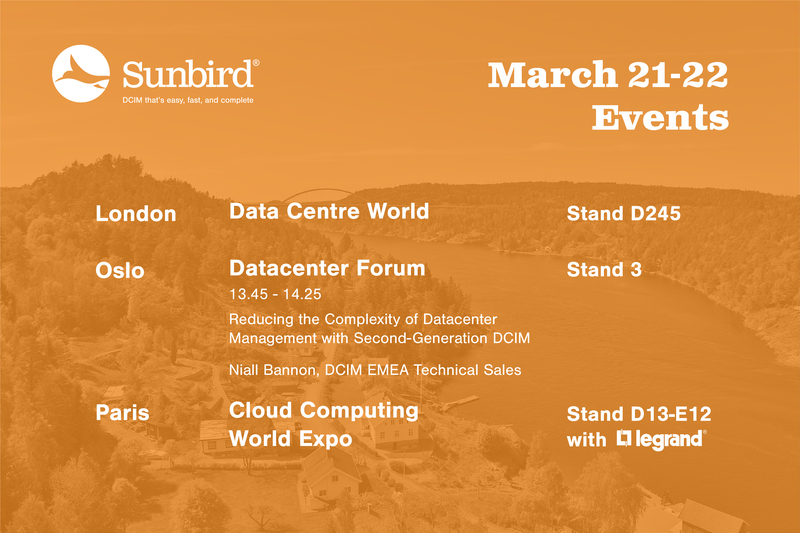 You don't want to miss Niall Bannon, DCIM Technical Sales EMEA, present "Reducing the Complexity of Datacenter Management with Second-Generation DCIM" in the afternoon. Also, stop by Stand 3 to get a demonstration of our second-generation DCIM software. If you're involved with the managing and operations of your organization's IT infrastructure, register for free to join 250 of your colleagues from the data center sector in Norway. Let us know if you'd like to meet. Our strategic partner, Legrand, will be at Cloud Computing World Expo in Porte de Versailles from March 21-22. We will join them in their booth to demonstrate how our DCIM solution works seamlessly with Raritan iPDUs to optimize your data center management. Let us know if you'll be stopping by Stand D13-E12 to visit us.